Ovarian cysts are fluid-filled sacs that develop in or on the ovary. Ovarian cysts occur commonly in women of all ages. Ovarian cysts are fluid-filled sacs that develop in or on the ovary. Ovarian cysts occur commonly in women of all ages. Some women with ovarian cysts have pain or pelvic pressure, while others have no symptoms. Irregular menstrual periods or abnormal vaginal bleeding are not usually related to an ovarian cyst. Fortunately, most ovarian cysts do not require surgical removal and are not caused by cancer. Cysts can vary in size from less than 1cm to greater than 10 cms. These are terms used based on the radiological (usually pelvic ultrasound) appearance of the cyst. Simple cysts are generally reassuring and are often managed conservatively i.e. without surgical intervention. Most complex cysts are not cancerous but those with ‘suspicious’ features need prompt specialist evaluation. Ovarian cancer is a serious condition but is relatively uncommon – in females in the UK, ovarian cancer is the sixth most common cancer. More than half of ovarian cancer cases in the UK each year are diagnosed in females aged 65 and over. Incidence rates for ovarian cancer in the UK are highest in females aged 75-79. Since the early 1990s, ovarian cancer incidence rates in females have remained stable in the UK. Functional – These are common with the 2 main subtypes referred to as ‘Follicular’ and ‘Corpus Luteal’ cysts. Formation of these cysts will depend on factors such as the stage of the menstrual cycle and whether or not ovulation has occurred. Functional cysts usually resolve without treatment. Dermoid cysts – Dermoid cysts (mature cystic teratomas) are one of the most common types of cysts found in women between age 20 and 40 years. They are usually benign but may twist (torsion) in some cases, causing pain and/or nausea. These cysts arise from what are called ‘totipotential germ cells’ and as a result may contain a diversity of tissues such as hair, teeth, bone/cartilage, sebaceous glands and thyroid tissue. Polycystic ovary syndrome (PCOS) – Women with PCOS may have many small cysts. These cysts do not need to be removed or treated with medication, but women with PCOS may have other symptoms requiring treatment. Endometriosis – Women with endometriosis can develop a type of ovarian cyst called an endometrioma, or “chocolate cyst.” These cysts may cause pain and are associated with subfertility. Cystadenoma – These are common, benign tumours containing clear or mucous fluid. They arise from the surface epithelium of the ovary. They are often asymptomatic but may become large and cause significant pressure symptoms in the abdomen and pelvis. They may also twist (torsion) causing pain and or nausea/vomiting. Pelvic infections – Severe pelvic infections may spread to involve the ovaries and fallopian tubes. As a result, pus-filled cysts form close to the ovaries and/or fallopian tubes. Cancer – In premenopausal women, although ovarian cancer may occur, the vast majority of ovarian masses and cysts are benign. Postmenopausal women — Ovarian cysts are common in postmenopausal women. The greater use of ultrasound in gynaecological practice and the widespread generalised use of other imaging techniques such as computed tomography (CT) and magnetic resonance imaging (MRI) mean that an increasing proportion of these cysts will be found incidentally. The vast majority of these identified cysts are benign. However, in postmenopausal women, new growths on or around the ovary are somewhat more likely to be caused by cancer than in premenopausal women. 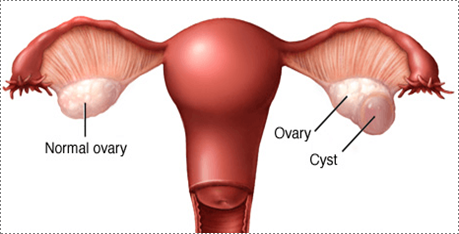 Ovarian cysts may be either symptomatic or asymptomatic. Women with symptoms from ovarian cysts typically experience pain or pressure in the lower abdomen on the side of the cyst. Pain may be dull or sharp; it may be constant or come and go. If an ovarian cyst ruptures, a woman may experience a sudden sharp pain, which may be severe. Women with torsion (twisting) of an ovary may feel pain along with nausea and vomiting. Ovarian cysts can sometimes be detected during a pelvic examination. However, most ovarian cysts are diagnosed by imaging – pelvic ultrasound scan is the usual imaging modality used. Computed tomography (CT) scan or magnetic resonance imaging (MRI) are also sometimes used, but less commonly. These imaging tests also provide information about the cyst’s size, location, and other important characteristics. Blood testing — One or more blood tests may be recommended if you are found to have an ovarian cyst. The blood test(s) can help to determine the nature of the cyst. ‘Watchful waiting’ – this involves monitoring of symptoms and often repeat imaging at some point. The timing and frequency of further imaging will depend on individual circumstances. Surgery – in general, If a cyst is large, causing significant pain/pressure, associated with subfertility or appears suspicious for cancer, surgery may be recommended to remove the cyst or the entire ovary. Surgery to remove an ovarian cyst — Most ovarian cysts can be surgically managed using a laparoscopic approach (‘key-hole surgery’) – See TREATMENTS page for more information regarding laparoscopy. Occasionally a laparotomy (larger incision in the abdomen) may be required.